Tech Life is a 3 column web template which diagonally fits best on any mobile or screen device. The concept used on Tech Life Blogger Template is added to suite perfect on any android application. 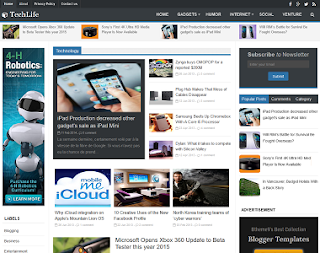 Tech Life blogger template has an attractive header which will suite best to add on WebView android app. 4 recent post are set to keep sliding below navigation menu. 8 featured posts can be picked and placed from 2 different labels.